We had the pleasure of hosting Jane Erbacher for her Project Row and Project Ski seminars this past weekend. If you have been following our social media, you will have seen that it was a resounding success. 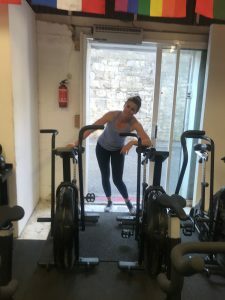 In all honesty, I was aware of Jane’s work on social media but I never paid it too much attention – I felt I knew enough about the Erg and (embarrassingly) felt as though I was a bit of a local authority on the SkiErg, purely from the fact that we were early adopters of the machine here in at SDSC. I laugh (and cringe!) when I realise now just how little I knew about both machines. The cogs of this operation started to turn when Jane was visiting the guys in Concept2 and mentioned us here. I then chatted to Jane briefly for a few weeks before she arrived through emails and the first thing that hit me was her attention to detail on everything she did. No sooner had we agreed to host the seminar, she sent me information on hosting seminars, social media updates, images etc. 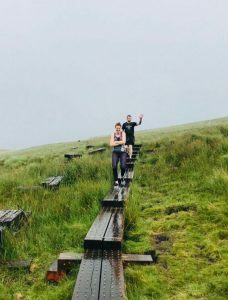 and her general attitude and willingness to help, put me at ease straight away and even at this stage of the process there was plenty of positive things that I could take away from the experience. I met Jane at the airport a few days before the seminar and I was typically 30 minutes late collecting her – I just wanted to let her have the full authentic experience of Irish time-keeping and deal with the local concept of ‘I’ll be there in 5 minutes’ (which can be anything from 15 minutes to 30 minutes). Jane was easy to find, she was the only one with a big smile on her face in the whole airport and she was busy working on her phone – a work ethic, which I later realised, is second to none. Immediately we clicked and from our combined years in the fitness industry and mutual acquaintances / friends through our travels, we had plenty to talk about. I knew it was going to be a fun weekend. Before the seminars, we had a few days to do some sight seeing and even though our time keeping can be poor, we do make pretty good hosts! Apart from trying to get a coffee at every coffee shop in Dublin, we made the trek to Glendalough and before we set out to hike around the lake, we made sure to administer the factor 50 sunscreen – which may have been over ambitious, as 30 minutes later we were hiking through torrential downpours. Jane getting to experience another Irish event – 4 seasons in one day. Before the seminar, Jane got to train with us in SDSC and she jumped into the classes. Her enthusiasm for training and ability to push herself and still smile, was contagious and personally I felt it was great for our members to see – at one stage she jumped onto an Assault Bike and cranked out 135 cals in 10 minutes. And then did a workout!! Generally that type of behaviour here would require epic levels of negotiation. So Day 1 started bright and early with an overview of what the weekend would entail. This was the first moment that I really began to realise the level and depth of Jane’s knowledge around the Ergs and clearly the amount of research she has undertaken on the subject. Initially we jumped onto the SkiErg for a 90 second all out attempt. This was a good way to break the ice! 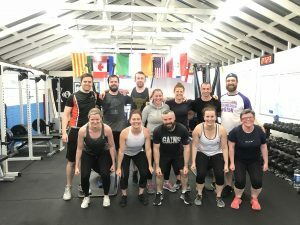 The nerves were palpable in the room but once it was over there was a collective sigh of relief and immediately it became apparent just how much our form was breaking down at the higher intensities. Jane now had everyone’s undivided attention. From there we looked at the SkiErg and the mechanics and biomechanics involved. I had done a small amount of research but already I knew this weekend was going to increase my knowledge ten-fold. 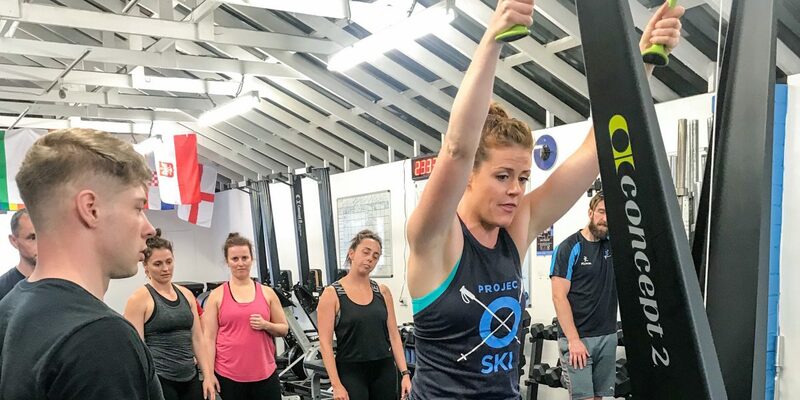 We looked at some warm up drills that could be incorporated into SkiErg workouts, choosing movements that mirrored the demands and positions of the catch and finish positions (such as hollow holds, ball slams, active hangs into drops etc.). Already I could see where I was losing a lot of power and efficiency. After lunch we spent more time delving into the rowing machine. Much like the SkiErg, we were looking at technique which would be most efficient and optimal for general populations. 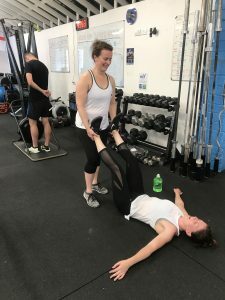 As Jane stated, the technique here would be different than for rowing on water – much the same way the technique we were learning for the SkiErg would be different from Cross-country Nordic Skiing. The big take away from Day 1 was the concept of Push – Hinge – Pull. We delved into this in more detail but it presented a concise pathway for rowing and skiing with optimal form and efficiency. Day 2 was a little more full on in terms of depth of knowledge and also more intense in terms of working out. We looked at the flywheel in more detail and this was a huge light bulb moment for me personally (and I am sure for everyone else in attendance). All of us were guilty of having the drag factor / damper setting too high and this was really causing us to crush ourselves and ask for unsustainable effort. We used a partner drill to find our most efficient / comfortable drag factor and this really helped people understand the importance of finding our optimal drag factor. One of the benefits of this partner drill was the ability to feel the change of damper setting in real time / mid movement – this would be impossible to try on your own. We also looked at the common technical faults seen on both machines, what they mean and how to correct them. At the end of the day we had a final tempo workout on the SkiErgs. It was brutal! I was last up and by the time I was starting, the butterflies were in full flight! 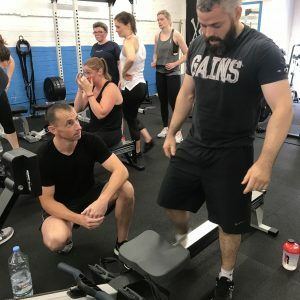 From training and attending previous seminars I knew of the energy that can be created in a room when everyone leaves their ego aside and pushes themselves beyond what they thought they could do (with the help of everyone else in attendance) – its an amazing thing to be apart of and to see it happening in my gym was a proud moment. Even thought I felt like I was going to pass out. The weekend exceeded everyone’s expectations. On the following Monday, quite a few people said they missed Jane and the seminar format. I picked up so many invaluable nuggets from a coaching and training point of view. 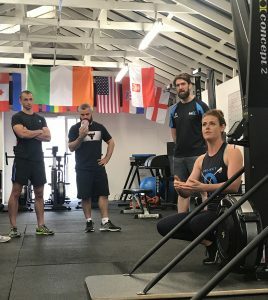 Jane was incredibly generous with her time and knowledge all weekend and not at one stage did she show any signs of going through the motions, in fact on the following Monday she was training in the gym and offering to help people with their rowing and skiing technique still! I have mentioned it before but Jane’s attention to detail and the way she had the whole process of hosting a seminar systematised, was extremely impressive (and something to aspire to). It is clear that Jane is 100% committed to helping people improve on the Erg and SkiErg. It is also clear that she wants to keep improving herself and she is constantly looking for suggestions on how to improve her own delivery – always the sign of a strong leader. I have to say this was easily one of the best seminars I have ever attended. From start to finish, I don’t think there was one moment that I was clock watching – the whole weekend was packed with relevant information that could be implemented immediately. The information provided will absolutely change how we program conditioning sessions here at SDSC. I do feel like a bit of a fraud admitting it but when I look back, we were clearly not giving the conditioning aspect of what we do the same respect as the strength work in terms of the technical components. On certain days we would pretty much ask folks to just hop on a machine and as long as they were not hurting themselves, and sticking to certain work /rest periods, that was enough. This weekend was a reminder that it isn’t enough. 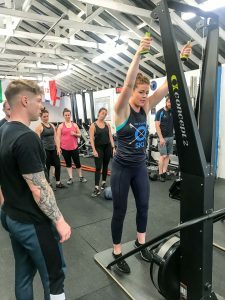 I strive to be better of all areas of my coaching and with what were are already implementing, I feel as though the standard in the gym will rise dramatically after our encounter with Jane. This weekend was much more than an incremental jump, it has spurred a dramatically lasting change to how we coach here and all of our members and future members are going to benefit. It is only a day since she has left but we miss Jane already and will hopefully see her back in the future!